To integrate with a mailserver on another computer, you should set the IP address to the IP of the computer running the mail server. If Hexamail Guard and your mail server are both on the same LAN, then this will typically be an address of the form 192.168.x.y. Alternatively you can set the hostname to be the LAN computer name, or fully qualified hostname if on a WAN. The port should be the port your existing mailserver is using, typicaly port 25 (SMTP). Only use another port setting if you are sure that your mailserver is not using the standard SMTP port 25. Once setup you also need to direct incoming SMTP email traffic to go to Hexamail Guard instead of your mailserver. This can be done at your router/firewall using NAT (direct all incoming port 25 TCP traffic (SMTP) to the computer running Hexamail Guard. Alternatively you may need to configure your MX entries to direct incoming SMTP traffic to the Hexamail Guard computer. Your ISP or domain hosting service will be able to help with this. Enter your existing mail server IP address and port into the appropriate boxes. 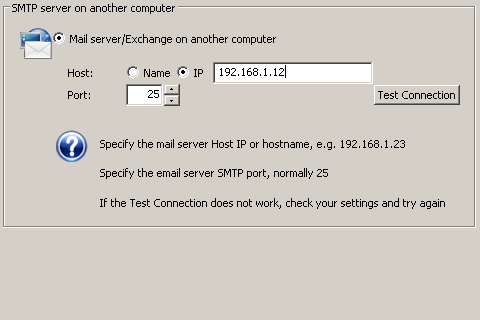 Use the Test Connection button to get Hexamail Guard to make a test connection to your mail server, verifying that the mail server is accessible to Hexamail Guard on the specified IP address and that the configuration is correct.